One of the benefits of living in London are easy access to Europe. The downside of living in London is the effort getting to those airports – I’ve forever been spoilt after our trip on the Eurostar to Paris. Fortunately we have a direct coach service that is less than 10minutes walk from our house. Unfortunately, this coach was 45-minutes late, and it then took 30-minutes longer than scheduled to get to the airport, for a grand total of 1:15 delay. It was lucky that we caught an earlier bus. We woke at 5AM for a 9AM flight, and had to run from the bus stop, through security and immigration, and out to the gate. Things were probably so bad due to the strikes taking place on the regular train lines to Gatwick. I was worried that we might have delays taking off, as we were passing through a thick fog in the coach, however it didn’t seem to cause any problems for the pilot taking off. The fog was even thicker in Venice, and landing was a little surreal, as we didn’t spot the ground until moments before making contact with it. I won’t lie, I was a bit sad that we didn’t have clearer weather for our visit. It sounded like a bit of a gimmick, but catching the water taxi from the airport to town was actually a very good option. It was a little eerie drifting through the fog, seeing little more than the wooden tetrapods that marked the edge of the passageway. If only there were occasional bursts of static I would feel like I was in Silent Hill. Arriving at our stop in Venice didn’t do much to change the feeling of being in a horror video game, as the town felt mostly empty, and not at all being the way I imagined Venice to be. Risa, who had visited before, said we were lucky, as it’s usually a crush of people. I knew this weekend was going to feature a huge amount of photos, and this started the first time we crossed one of the small interior canals. It wasn’t anything special for Venice, but I thought it was amazing, and I had to stop and take photos each and every time I crossed one of the hundreds of small bridges. A friend had recommended a small restaurant, Bar Puppa, and it happened to be just around the corner from our hotel. It’d been a long day, and we were ready to eat a proper meal! I’m ashamed to admit, but I actually ordered the burger – I know, I should be eating Italian food when in Italy, but I’d heard good things, and the pictures on the wall looked great. Amazingly, the burger actually looked better than the pictures, though I was at a bit of a loss how to actually eat the thing. I ended up using a knife and fork, as it was what everyone else was doing. It was certainly a different take on a burger, with the thick stuffing of shaved vegetables giving it a more healthy taste – of course, there was just as much fat, oil and grease as a normal burger. Risa’s pasta looked (and tasted) amazing, so we were both happy, happy tourists. We continued to walk without direction, purposefully getting lost amongst the tiny alleys. It was now, after about 30-minutes of wandering around that I’d finally noticed the utter lack of cars. It was incredible! It wasn’t completely silent, as there were still motorised boats making plenty of noise, but being free to walk without having to be concerned about cars was amazing. It was actually strange seeing cars again when we finally left Venice three days later. By chance, we ended up at the Rialto Bridge on the Grand Canal. The views were amazing, with the fog giving a somewhat supernatural, old time feel to the place. Unfortunately, with the sun well and truly hidden, and it being in winter, it was quite cold – much colder than London, which in reality isn’t as cold as it’s made out to be. This was all old to Risa, but for me, every time I saw a gondola, complete with gondolier in their stripy uniforms, I got very snap happy. We’d had fun wandering without direction, however we’d finally decided to go to San Marco Square, which is quite simple, once you notice the signs that are all over town. Trying to get there using the GPS navigation of my phone was less successful, and frankly confusing! Risa was once again amazed at the utter lack of tourists, for which I was truly grateful! I’ll happily put up with chilly weather for space. Risa was demonstrating that the pigeons will just fly and perch on you without giving them any food. It didn’t quite work out for her. It was at this point that a man stealthily poured some semolina into her hand and the birds then mugged her! Our little pigeon feeder cheekily asked for €10. I wouldn’t have given him anything, but Risa had a good laugh, and it made for good photos, so I gave him a euro for his troubles – which he took, and then ran away from the approaching police! I know that you’re not meant to feed these birds… It was actually quite amusing watching this game of cat and mouse with the police and these guys once we’d noticed what was going on. Approaching the Saint Mark’s Basilica (which was free of any queue), it was incredible to see the almost tacky use of marble. There were all sorts of shades of marble, from a reddish purple colour, to greens, blues and many shades of grey. It wasn’t possible to take photographs inside the cathedral, only of the outside. I think I would have purchased a photography ticket if I could, as it was truly beautiful – even with the dull light from the dim cloudy day. I’ll have to be satisfied with the photos from the outside. There was an absolute chaos of things vying for attention – even the floors were amazing, with intricate tile work and patterns, many of them looking like optical illusions – however the undulations on the floor was somewhat concerning. Our necks got quite sore though from staring at all the gilded illustrations on the ceiling! We wandered a little further around the area, taking in the Bridge of Sighs (so called as it was the last view the water that prisoners would see after being sentenced and walked across the bridge to the prison, to which they would sigh a breath of sadness), and some gravity defying buildings that seem like they could rival the tower in Pisa. Apart from visiting San Marco Basilica, we didn’t do much other than wander around. Back alleys. Side streets. Waterfront. Another bonus of being there during winter were the Christmas lights strung up all over town, adding light and character to what would otherwise be very dark passageways. Risa found a nice restaurant right by our hotel, Trattoria da Bepi già “54”. It was worrying when we arrived and the place was empty, especially seeing so many other places that were quite busy. The place eventually filled up, and we were lucky to have beaten crowds and got our meals nice and quickly. Risa had more seafood pasta and some amazing monkfish. I went for a delicious venetian style squid (the black thing!). Food was great, and the ambience/service was also fantastic. Sadly, our hopes of the weather clearing only partially came true. It was still quite foggy and cloudy, but less so than yesterday. The weather forecast predicted a sunnier day tomorrow, so we decided to try and do some of the indoor things today instead – such as Doge’s Palace. 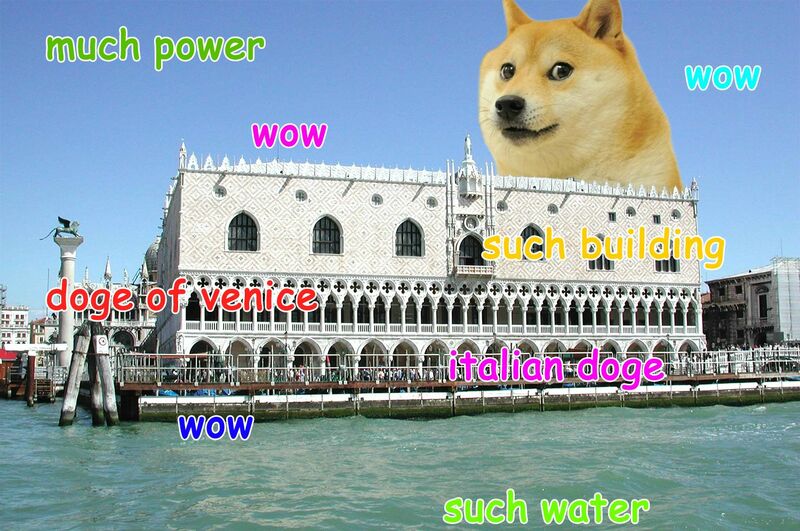 Unfortunately, I’ll always think of Doge when I read it, rather than the Venetian head of state. Again, as with the San Marco Basilica, there were no queues and no waiting to enter the palace. All the comments in guidebooks and online suggest to pre-book to avoid the hour plus queues! That would have driven me crazy, so once again, I’m grateful to be visiting in the off-season! Unsurprisingly, the palace is opulent. The public is only able to visit the areas that were previously used for official functions, such as the senate rooms and courts. The lavish decorations on increase the further you get into the complex. The stairway that impressed on first site, appears tame compared to the ceilings in the senate rooms, with beautiful interwoven gilded frames, with exquisite carvings. Travelling further through the palace, the truly enormous Chamber of the Great Council, which is nearly four times the size of a basketball court – and without a single interior support – outclasses every other room in the palace. Again, we were getting a sore neck trying to take in all the details. It wasn’t just gold and glamour, crossing the Bridge of Sighs from the Palace took you to the old prison. It’s interesting that they have protected the graffiti, some of it hundreds of years old – including some truly interesting pornographic murals. The rest of the day was spent doing more of the same, wandering around town, visiting different neighbourhoods, finding different churches, and plenty more canals and bridges. The downside to being here in winter, other than the chill, is how quickly it becomes dark in the evening. It’s actually quite dark when the sun goes down, too. Other than the bright lights of the restaurants and souvenir shops, there isn’t a lot that is illuminated. Oh, and speaking of souvenir shops, the masks that they were selling were amazing! I have zero need for them, but it doesn’t mean I don’t want some of them – you never know when an impromptu need to be creepy will arise. Our final day in Venice, and the sun was finally shining down on us. It seemed that it didn’t make any difference to the temperature though – it was still chilly. As Venice is such a small city, it was quite easy for us to walk back over some of the frequently trodden ground, and see the sites again in sunlight. I have to say, I think I might actually prefer the fog – something about it made it look older and more mysterious. With it now being the weekend, we noticed the difference in crowds – as in, there were other tourists here besides us. We still walked straight into San Marco Basilica without having to wait. We thought now that the sun is out, we’d have another look inside, to see if the gilded murals on the ceiling were any more vivid now – they were. We’d been waiting for the weather to clear to ascend the cathedral tower opposite San Marco Basilica. This was the first attraction that we had to wait for, taking a little more than 5-minutes before we managed to catch an elevator. Again, I’m incredibly happy that we came during off-peak season. However, the views from the top would have made the wait worthwhile. It was incredible to look out over the entire city like this. We did our best to pick out the landmarks that we’d visited so far, which was surprisingly easy in a town this size. The sun might have been shining, but each gust of wind caused our teeth to chatter just a tiny bit harder. I saw this in a few places in town, and it is something that I have never quite understood why it wasn’t the defacto – a 24hr clock. Also, it was strange seeing the Roman numerals featuring IIII, rather than IV. The sunshine helped emphasise the details in the stone work, with the exterior of San Marco’s Basilica looking even finer than it had previously – as did Doge’s Palace. Our last items to tick off were some boat rides. First was a trip down the length of the Grand Canal, from the south, to the very north. It was surprising just how expensive this was (~€6 each) for such a short trip. Still, it was great to see the city’s sights from a different, more elegant perspective, passing by truly opulent mansions with facades that aren’t usually visible. We alighted at the terminus, and double-checked the location of where our shuttle bus left. It was also the first time we’d been near cars in over 48hrs. It’s incredible to think that it’s an unusual circumstance to be away from cars for more than 48hrs. I don’t think I’ve ever spent that long without seeing a car before – other than being lazy inside the house. This was a new part of town, and again, the camera was getting a workout at every bridge, every canal, every new perspective of a building. Even a seagull was enough of a reason to take a dozen photos. Of course, all this walking and shooting built an appetite – as Risa wasn’t shooting, she needed an Aperol Spritz as an apetiser. We used Google Maps to find the highest rated restaurant in the area, and we ended up in Trattoria Bar Pontini. There was just enough warmth in the late afternoon sun to allow us to sit outside. Risa had yet another seafood dish, and they were incredibly generous with their serving! My parmigiana might have been delicious, but it didn’t look a fraction as tasty as Risa’s did! There was just one item on the Venice Bucket List left for us to tick off (there were actually plenty of things that we could have added, but didn’t, such as the Opera, or any form of live music). Gondoliers wait at pretty much every bridge, with their plaque showing their rates. It was hard for me to justify paying €80 for a 30-minute boat ride, but it’s all part of the Venice experience. We attempted to barter it down, and agreed on €65 – or €70 if we thought he was worth that extra five euros. It didn’t drastically change the cost, but somehow it seemed more palatable, so we jumped aboard, and by jump, I mean delicately shuffled into our seat, careful to not rock the boat, lest we fall in. It was undoubtedly a nicer way to experience the city. The silence (at least locally), and the slow graceful movement was a big difference to the ferry, which rushed down the canal not allowing much time for eyes to wander around the details. The ferry is also unable to navigate down any of the smaller canals – and it was really only wide enough for this single gondola. Our gondolier, who said he was sixth generation in a gondolier family, managed to get around the tightest corners without a single bump or knock against the sides. It was only a thirty-minute ride, but by the time we were heading back, the buildings seemed to be glowing a warm glow from a sun low on the horizon. We paid our man his €70, and he hurriedly welcomed a wealthy family aboard. It’s hard to put a value on this, but as a standalone experience, I certainly wouldn’t spend this much money on it. As a whole Venetian Experience, it’s sadly quite essential. Consider it a Venice Tax, or Entry Fee. We caught the last rays of light, painting the buildings in a wonderful warm light. Of course, I took far more photos than I would ever look at again, but at the time, every single thing I looked at was exquisite and needed to be captured and shared. We booked a 10PM flight back to London, giving us several hours between sunset and having to catch the bus (to the other airport). Since we were in the area, we wandered around the old Jewish area, in what was the first Ghetto. There was still a very strong Jewish presence, with shops displaying kosher menus, and orthodox men with large black hats and curly sideburns. We’d heard about a walking tour that was mean to be quite insightful, but we were too late. It felt like this area was devoid of tourists. It felt like there were just regular Venetians going about their daily lives – picking up kids from school, shopping for dinner, social gatherings at the hairdressers. It was a short twilight, and then a dark evening, and a long slow journey home. It was amazing to think that we’d already spent three days in this unique and beautiful city. Weekends like this were the main reason for us living in London, and will be sorely missed when we eventually move on. It was a splendid weekend in Venice. I am sitting at my desk at work eating my cereal scrolling through this post when a huge Doge head pops up in Venice causing me to laugh out loud. haha, happy to hear it! Love the blog Ross. Brings back so many memories. Felt like we were there with you. Simply beautiful.